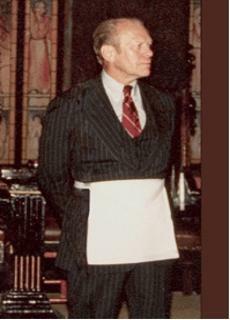 Gerald Ford in a masonic apron. 38th President of the United States of America, and Freemason. Malta Lodge No. 465, Grand Rapids, Michigan. His brothers were also initiated with him. Columbia Lodge No. 3, Washington, D.C.
And Honorary Member, Supreme council A.A.S.R. Northern Jurisdiction at the Academy of Music in Philadelphia. It is apparent to me that the Supreme Architect has set out the duties each of us has to perform, and I have trusted in His will with the knowledge that my trust is well-founded. One million Arabs are not worth a Jewish fingernail.